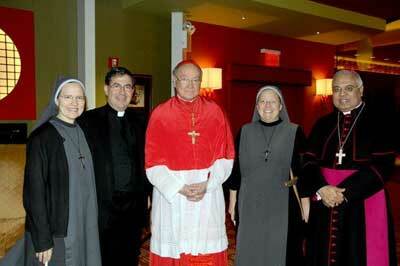 Left: At the Hilton Garden Inn for the celebration of Father Frank Pavone's 25th ordination anniversary are, from left, Sister Bernadette of the Disciples of The Lord Jesus Christ in Prayertown, Texas; Father Pavone; Cardinal Renato Martino; Archbishop Francis Chullikatt, Vatican representative to the U.N., and Mother Lucy, superior general of the Disciples if The Lord Jesus Christ. STATEN ISLAND, N.Y. -- The Rev. Frank Pavone, national director of Priests for Life in New Dorp, celebrated the 25th anniversary of his ordination to the priesthood on Tuesday with a mass and banquet at the Hilton Garden Inn in Bloomfield. Norma McCorvey, the "Roe" in the Roe vs. Wade U.S. Supreme Court case that led to the legalization of abortion in 1973, traveled from Dallas for the celebration. A longtime friend of Rev. Pavone and Janet Morana, executive director of Priests for Life, Ms. McCorvey is a convert both to the pro-life cause and to Catholicism. "The commitment to work to protect the unborn flows from our humanity," Father Pavone said in his remarks during the dinner. "There is no greater privilege." In attendance were Cardinal Renato Martino, president emeritus of the Pontifical Council for Justice and Peace; Archbishop Francis Chullikatt, permanent observer of the Holy See to the United Nations; Mother Lucy Lukasiewicz, superior general of the Disciples of the Lord Jesus Christ in Prayertown, Texas, and leaders of many pro-life groups from across the country. Catholic media personality Teresa Tomeo was the mistress of ceremonies for the dinner. Father Pavone's parents, Joseph and Marion Pavone, also took part in the celebration. Father Pavone, a native of Port Chester in Westchester County, attended seminary at St. Joseph's Seminary (Dunwoodie) and was ordained by former Cardinal John J. O'Connor in St. Patrick's Cathedral in Manhattan on Nov. 12, 1988. His seminary class, which included the Rev. Louis Jerome, pastor of Sacred Heart R.C. Church in West Brighton, was the last to be ordained in November; since then, ordinations have taken place in May. Following his ordination, Rev. Pavone was assigned to St. Charles R.C. Church in Oakwood, and served as parochial vicar there until 1993, when Cardinal O'Connor released him to work full-time in pro-life and to assume the leadership of the two-year-old Priests for Life that year. Twenty years later, Priests for Life/Gospel of Life Ministries is the umbrella organization for a dozen ministries that are international in scope and focus on every aspect of abortion. Pope Francis told Mrs. Morana and Rev. Pavone during visits to the Vatican that he is aware of the work of Rachel's Vineyard and the Silent No More Awareness Campaign, both of which focus on post-abortion healing. Pope Francis expressed his hope that the work would continue. Rev. Pavone will return to St. Charles on Sunday, as the celebrant and homilist at the 1:15 p.m. mass.